Slots with progressive jackpots are among the main attractions online casino operators have to offer as such games come with mammoth prizes and appeal to a staggering number of players, looking to transform their lives and become millionaires. All respected software suppliers in the online gaming industry have developed bespoke progressive slot suites and giant Playtech is hardly an exception. Until recently, the developer’s suite of Marvel-branded progressive slots was a favorite of reel fans the world over. Unfortunately, Playtech failed to renew its license with Disney since the latter considered gambling licensing arrangements were against their family-friendly image. All was not lost, however, since Playtech opted for re-branding the expired Marvel-branded slots while maintaining their functionalities and the progressive jackpot network the comics-inspired games were linked to. This led to the introduction of the Age of Gods suite of progressive slots, which are based on various heroes and gods from the Ancient Greek mythology. The prize pools of the “godly” slots accumulate in the same manner like those of the slots from the former Marvel series. Again, players get the chance to potentially land one of four huge prizes. The seeds of the pots and the bets’ contribution remain the same and so do the slots’ features, at least for the most part. The only difference is that the graphics have changed. One thing is for certain – Playtech once again succeeds in proving its immaculate reputation of a leading software supplier is entirely justified. Before we proceed with the Age of Gods suite itself, we would like to say a few words on some of Playtech’s key achievements in this industry since there are plenty of those. The software supplier emerged on the online gaming scene in 1999, with the chief goal to create a casino software platform that was unlike anything else players have seen before. It is fair to say this mission was accomplished as Playtech quickly took off and introduced its Live Dealer platform and the Bingoland bingo network in 2003. The following year saw the launch of iPoker, which went on to become the biggest multi-skin poker network on the global scale. A year later, in 2005, the developer introduced its first suite of mobile games to the enthusiastic casino fans the world over. The years to follow were marked by more achievements for Playtech which acquired the reputation of one of leaders in the online gambling industry. The developer added a sportsbook to its product offerings and expanded on a number of regulated markets. Because of this huge success and the superior quality of its software, it is hardly surprising Playtech was honored with a number of prestigious accolades, including the Gaming Intelligence award for Poker Supplier of the Year and the Best Digital Industry Supplier at the Global Gaming Awards in 2016. 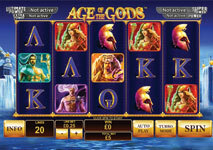 The slots from the Age of Gods suite are considered the ultimate option for players aiming at hitting life-changing jackpots. The suite comprises several titles inspired by Greek goddesses, gods, titans, and heroes and each individual slot is linked to Playtech’s Age of Gods jackpot network, which is to say the pools for the progressive prizes grow across all online gambling operators powered by this software supplier. Speaking of progressive prizes, the Age of Gods slots are linked to four of those, the Power, Super Power, Extra Power, and Ultimate Power jackpots. Each of these has a different tipping point, with the Power jackpot hitting every 15 minutes on average, being the smallest of the four. The jackpot network operates precisely like that of the former Marvel progressive suite. Each player betting on one of the linked titles contributes to the jackpot pools as 0.99% of each wager is split and goes towards the four progressive prizes. Each of the four jackpots seeds at a different base amount, but naturally the Ultimate Power prize has the largest seed of €100,000. The four jackpots hit at random and there is no particular symbol combination players need to align in order to pocket the prize. More importantly, the jackpots can be triggered even on losing spins by any bet amount during the base game. However, players should bear in mind that the probability of landing the life-changing prize grows proportionately to their bet size, which is to say you have higher chances of bagging a jackpot with larger bets. One thing is for certain – once someone manages to trigger the jackpot bonus game, they are guaranteed to end their gaming session with one of the four prizes. At this point, players will leave the base game and will be taken to a separate screen where they need to click on twenty gold coins and reveal one of the four matching jackpot symbols. Each of these symbols corresponds to one of the pots. Players are provided with limited time to click on the gold coins as the bonus game utilizes a timeout timer. If the time elapses before you have clicked on all twenty coins, you will be awarded a random progressive prize. The jackpot network utilizes the EUR as a currency so all four progressive prizes and their seeds are in this currency. This means if players win a prize while betting in another currency, the amount will be converted, depending on the current conversion rates for the day. If you are looking to scoop a mammoth jackpot, playing one (or more) of the progressive slots from Playtech’s Age of Gods series is certainly a good way to start. Each of these games is superb when it comes to graphics, sound effects and interface as becomes slots from the collection of Playtech. Below, we have listed five slots from the series which offer players a plethora of great extra features, huge prizes, and quite reasonable RTPs. King of Olympus provides players with the opportunity to make bets on 25 fixed paylines across the five available reels. The game takes players to the Pantheon on Mount Olympus and its center character is Zeus, the Greek god of the sky and thunder. Some of the symbols players are likely to come across while spinning the reels include an eagle, the divine stallion Pegasus, an amphora, and a harp. Betting options are extremely flexible, with coin denominations ranging between 0.01 and 100.00 per payline. Apart from the fantastic, crystal-clear visuals, players will benefit from a wide range of special features. For instance, the Pantheon is a scatter with an increasing multiplier while Zeus himself functions as a wild, which can potentially trigger bonus spins or substitute for all symbols with the exception of the scatter. 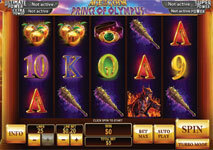 The RTP of King of Olympus stands at 95.98% which certainly is not bad for a progressive slot. The game the entire suite is named after is a sleek 5-reel slot with 20 fixed paylines that has been optimized for a wide range of devices, including smartphones and tablets that operate on iOS and Android. Players can bet anywhere between 0.20 and 500.00 per spin, which renders the game suitable for daring and risk-averse slot fans alike. Age of God is a feast for the eyes since the graphics are exceptionally colorful and vibrant. Since the game was obviously inspired by the gods that dwell on Mount Olympus, the majority of the symbols on the reels are represented by Greek deities and demi-gods, the likes of Poseidon, Zeus, Hades, Hercules, and Athena. Players should brace themselves for plenty of lucrative features including wilds and the Age of Gods scatter that triggers the rounds of free spins. As a matter of fact, there are different rounds of free spins inspired by the different Greek deities. The multipliers during such bonus rounds vary depending on the god or goddess but the maximum number of free spins one can unlock is set to 9. The game comes with an RTP of 95.02%. 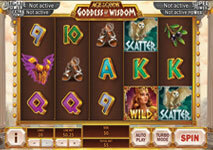 Goddess of Wisdom is yet another progressive slot from the Playtech Age of Gods suite which can potentially make lucky players millionaires. As becomes a Playtech slot, this 5-reel game with 20 paylines is graphically spectacular and utilizes symbols like helmets, pendants with Gorgon’s head, sandals, armors, and olive branches. Players get to bet as little as 0.20 credits per spin which renders the game suitable for slot fans with a limited budget. Lovely goddess Athena assumes the role of a wild in this game. The owl symbol, on the other hand, is a scatter and whenever three of those hit the second, third and fourth reels, they unlock the Battle Game feature where players get to choose from three different modes of free spins. The maximum number of bonus rounds the game can reward you with is set at 14, with 2x multipliers on the winnings. The Goddess of Wisdom comes with an RTP of 94.94%, which is not too shabby for a progressive slot. 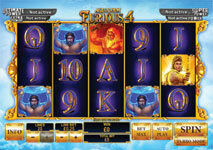 The Furious 4 is a 5-reel slot with a total of 20 adjustable paylines that features various titans, deities and key characters from Greek mythology. On the reels we get the insidious Pandora, the titan Atlas, the god of craftsmen Hephaestus, and Apollo holding a golden arch. These are among the highest-paying symbols in the game. Players get to choose from an extensive range of coin denominations with a maximum bet per spin that is set to €200 or the equivalent in other supported currencies. The symbol with the Furious 4 logo assumes the role of a wild, while the scatter is represented by a golden throne. The scatter in question can potentially unlock up to 12 free spins with four different “furious” features – the Age of Light, the Age of Curiosity, the Age of Fire, and the Age of Endurance bonus rounds. However, it is impossible to re-trigger the free spins in this game, which has an RTP of 94.88%. One of the greatest advantages of this 5-reel slot with 25 adjustable paylines is that it has been adapted for a wide range of devices, allowing lucky players to pocket one of the four progressive prizes while on the go. The game has been inspired by the divine hero Hercules who is portrayed wearing a lion’s skin. Other symbols players get to see on the five reels include a spiked club, golden apples, and Cerberus. The Hydra is the symbol all slot fans are hoping to see simultaneously on the first and fifth reel because it unlocks a bonus game, during which players are expected to help Hercules defeat the nine-headed monster and earn cash prizes or multipliers. Additionally, the game can reward players with 10 free spins with 3x multipliers as long as they hit three symbols with the Hercules logo anywhere on the reels. Other extra features include expanding wilds and the option to re-trigger free spins. The RTP of this progressive Playtech slot is estimated to be 94.82%.